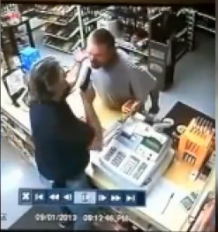 Andrew Branca at the Legal Insurrection web log has a good follow-up to the video running about the blogosphere of a recent attempt of a liquor store robbery in Missouri, wherein the would-be robber – a rank amateur, it would certainly seem, but no less potentially dangerous (or probably even more so) – confronts the store clerk who turns out to be a retired Army veteran of four tours in Iraq, a former corrections officer, and a private detective. The robber quickly arrives at the understandable conclusion that he should flee the scene. "You need to get out of here before I blow your head off." It's worth noting that this is how the vast majority of defensive uses of firearms end – without a shot being fired, the defensive display of the firearm being sufficient to defuse the situation without injury to either party. Branca goes on to write about the elements necessary to determine a proper armed defense response, points that one should grasp well prior to any such situation because it is typically spontaneous. This leads to the usual 'what if' discussion revolving around the question of "Would the clerk have been justified in firing on the robber?" The robber drawing his weapon and stating that the clerk needs to give him "all his money" would constitute a reasonable conclusion in my mind that the robber meant imminent harm, thereby granting permission to the clerk to blow him away by any means at his disposal. The comments section contains some good discussion as well – avail yourself of it (other than a needlessly prolonged 'who has the bigger gun' argument – and I mean 'gun' euphemistically). For my own input, it would appear that the robber would be 'under the influence', which to my mind would affect the reaction, and note that the clerk is carrying openly, with his handgun (apparently a Glock or variation) in a molded holster – Blackhawk or some such. One would think that any self-respecting robber would want to notice that before starting a confrontation. Other than gun stores hereabouts, I haven't seen store clerks carrying in a manner to provide optimum protection to themselves and the public, but then I live in a indigo-blue state that loves to intimidate the populace to make up for the fact that there are rather sensible laws left on the books from a time when the political climate involved more outside-the-beltway reality. Remember, the police show up only after a crime is committed. H/T to the Texas Scribbler. The bigger gun prattle is silly, really. A .22 pointed just inches away from the throat would impress anyone with a brain. Although, any robber might be short a neuron or six. Criminals do tend to be stupid. Which is why they're criminals. At that range, true, but how often do you get a chance like this, as if the clerk is saying "Hey, come here, lean in close. There's something I want to tell personal-like."? In my current vocation, I deal with a lot of stupid criminals, because they've been caught. An occasional smarter one drifts by because of lucky (or unlucky) circumstances, but it always amazes me about the effort and dedication they put into being criminals, when it would be far easier to get by just as comfortably financially by holding down a job wherein you put an honest day's work. That is one reason -- of many -- I'm so convinced that there really is such a thing as evil in the world. Hold On. This Will Be A Bumpy Ride.